We recently (softly softly) went live with Exhibitions Online. 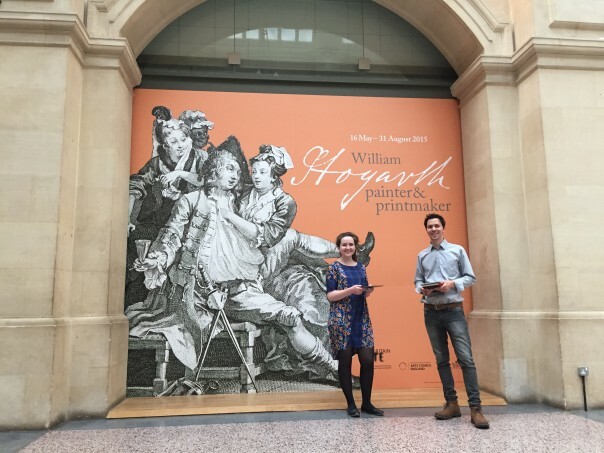 A place to translate our in-house exhibitions for an online audience, we worked with Mike and Luke at Thirty8 Digital to create a narrative structure with scroll-through content and click-through chapters on WordPress. They built in lovely features such as object grids, timelines, slideshows, maps and quotes. There are a few exhibitions already up, past (death: the human experience) present (Empire through the Lens) and future (What is Bristol Music?). We’ve most recently used it for our European Old Masters gallery to showcase a beautiful painting we have on loan for two years: St Luke Drawing the Virgin and Child by Dieric Bouts (I discovered the Pantone app with this one, taking the red from the gallery to use online. V satisfying). I’m currently working with the exhibition team to get our Pliosaurus! exhibition up – watch this space for some fun things with that one, which we’re hoping to use for interp in our Sea Dragons gallery at Bristol Museum & Art Gallery too. So far, we’ve found the content and arrangement really depends on the exhibition. The idea isn’t to simply put the physical exhibition online (I say ‘simply’, as if it would be) but instead to use the format and content of the exhibition to engage with people in a different environment: albeit one where we’re competing with a thousand other things for people’s attention. Exhibitions which have been and gone have been slightly more challenging, as the content was never intended for this use and has needed some wrangling. The more we use it though the smoother the process is getting, now that we know what we need and it being on teams’ plans as something to consider. 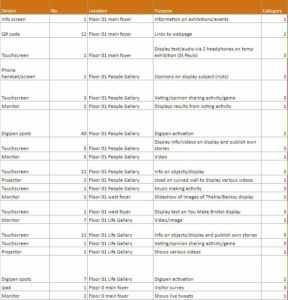 We’re still in the early stages of reviewing analytics to see how people are using it. Initial results are heartening, though, with a few thousand visits having had minimal promotion. At the moment most people are finding it from our what’s on pages (where most of our traffic to the main website is anyway) and we’re thinking about what campaigns we can do to get it out there more. We’ve just reviewed (and very much condensed) our Social Media Principles for the service. Have a read of them and let us know what you think! We haven’t done an update on website phase two in a while, mainly because we’ve been busy bees behind the scenes with testing and implementing lots of new stuff. 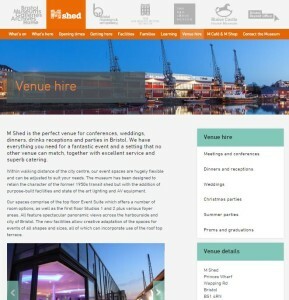 After workshops and testing we decided to go down the route of event types for venue hire – we have lots of interesting conferences at M Shed, really exciting evening events at Bristol Museum & Art Gallery and lovely weddings at Blaise Castle House Museum so can adapt these depending on what people need and what our offer is. People can find information on room spaces such as capacities, download our menus and contact us to book really easily. Know anyone who wants to hire a pretty special venue in Bristol? Send ‘em our way! Right now we’re in the middle of developing our ticketing functionality, which we’ll be using for our what’s on events (to replace third party sites such as eventbrite) and eventually for learning workshops. For this we’re using WordPress plugin Event Espresso; we’ve been really impressed with how this works and we’re pretty confident it’ll make the user experience so much nicer for people wanting to book with us. There’s a lot of work for us to do on fulfilment (we need to decide what to put on confirmation emails and tickets), setting up a new database and making sure people can navigate through registration easily. Next up is user testing with teachers and learning people which will be at the beginning of July. We need to cover a number of things for learning: showing our offer (school workshops, gallery visits, teacher training etc), giving users the right information to be able to plan their visit (such as risk assessments) and then being able to book and take payments, so we’ll be testing all of this. We’re aiming for learning sections to be in place before the new school year and what’s on updates to be in place before our next What’s On guide comes out in September. Well it seems it’s March already. This means we’re now two milestones into project website phase two. 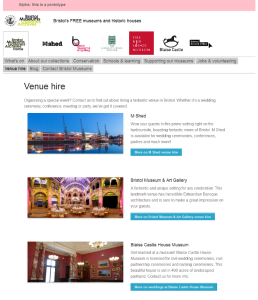 We’ve done a chunk of work on events filtering, which you can try out here: http://www.bristolmuseums.org.uk/whats-on/ Hopefully you’ll agree it’s pretty simple and useful. Of course we did a spot of user testing for it and got lots of positive noises from people – let us know what you think of it. 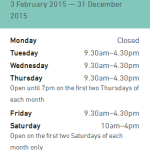 We also worked a bit on improving how our opening times are displayed. 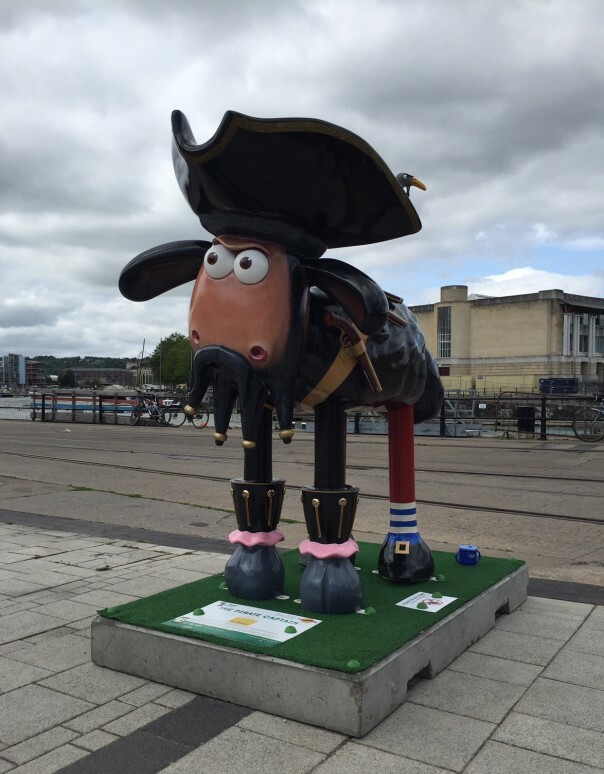 We added the option to add ‘notes’ to particular days, which is mainly for Bristol Record Office who have a range of opening times across any given week or month. We’re really trying to make it as clear as possible when our sites are open (and of course each of the six sites have different opening times across different seasons over any given year). Other stuff for milestone one included nicer 404 pages, WordPress upgrade and some other bits and bobs from phase one. So, onto milestone two. 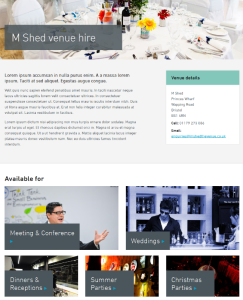 During February we held three workshops – for venue hire, what’s on and learning. In these we got a load of people from all over the service together to map out who our users are and what they need from us for each. Ben over at fffunction is going to talk more about how we get from the workshops to the prototypes in a future post, but for now I’ll leave you with a couple of images to show where we are with our venue hire section. 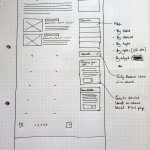 At the moment we’re testing the prototype and putting together some visual designs for it. I’m sure it won’t be long until it’s live, and in the meantime we’re starting to think about how we show our learning offer and enabling users to book workshops online. I’ve worked at Bristol Museums for just over two years now, and still now and then I’ll be chatting to someone or receive an email saying “oh, did you know that such and such website is ours?” Which I then add to my growing list and maybe have a little grumble to myself about. Now, on the one hand, it’s great that people are telling us about these (anyone else want to let us know of any more, please?) but on the other it creates a bit of a headache for us in keeping track of exactly what content of ours is online and how people are using it. It’s easy to just assume that, because they’re pretty old and incredibly out of date in some (most) cases, that they’ve been forgotten about and people don’t use them. This isn’t necessarily the case, though. 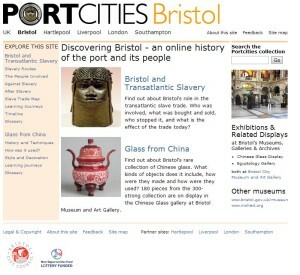 One example of this is the Portcities website – http://discoveringbristol.org.uk/ – which was made around 2003. It gets a huge amount of traffic – just over 470k unique pageviews in 2014, which is coming up for nearly half of the amount we get to our main website www.bristolmuseums.org.uk (around 1m a year and growing). There’s clearly a purpose for this content, so we need to think carefully about what we do with it. We’re working really closely with our Learning team to try to map this out, find the opportunities and see what we can do to best serve these users. 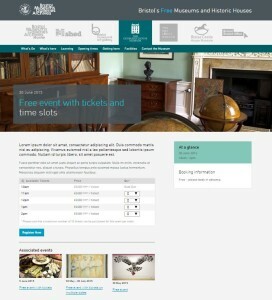 We’re now starting work on phase two of our website, www.bristolmuseums.org.uk, as Zak has already mentioned. So here’s a bit more detail about what we’re planning, once again following the GDS phases of service design. We’ll be working with the guys over at fffunction in three stages over the next three months. From an evaluation of user needs and developing on from phase one, we’re going to be focusing on things that generate revenue and make it easier for people to book with us; whether that’s improvements to the what’s on sections (which get the majority of visits), learning and venue hire. Updates and work carrying on from phase one on opening times, events filtering, navigation and what’s on sections. Workshops with the programming, learning and venue hire teams to really get to grips with what our users need from us online in these areas. Workshopping and implementing a ticketing solution for the above, making our online shop look a bit nicer and researching and implementing online donation functionality. We’ll keep you posted with how it’s going and what we discover. The Moved by Conflict exhibition at M Shed is comprised of many different types of technology to interpret content, from projectors to speakers. We used some new technology we haven’t used in the past to deliver this content, notably the RFID tag system. We had several briefs, but the one that stands out is: visitors need to have a personalised experience through the exhibition; the ability for visitors to have content of their choice delivered to them in the exhibition through digital means. The idea was to have stories being told through video, and we worked with Bristol Old Vic to bring a more theatrical performance to these stories. We had actors playing six fictional characters telling their stories, which would capture their lives before, throughout and the end of the First World War. We needed a way for visitors to trigger the content when they wanted to experience it. Initially we wanted hidden video screens (projections) around the exhibition and when a visitor walked next to it the video magically appears for them. To do this we looked into iBeacons, a Bluetooth technology which can be used to trigger an activity from a specified distance to the user, for example playing a sound when someone gets within two metres of a loudspeaker. Our concept was when someone gets to within a metre of a screen the content appears and when they leave that area the content turns off. 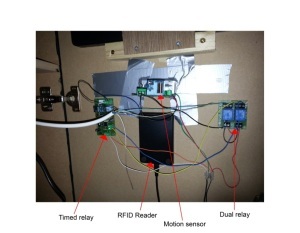 The trigger device would be a visitor’s smartphone or a small Bluetooth transmitter/tag. After a lot of research we found that this would cost a lot of money and would take a lot of time to develop – this technology is still very new, which is why it costs quite a bit. We looked then at long-range RFID technology, but this was also outside of our budget. We decided to go for short-range RFID, so a visitor would need to pick up an RFID wrist band and scan it in a specific location, as we were still keen on the idea of the content being triggered when you get to a certain distance. To do this we’d need to use a sensor, which wouldn’t trigger the main content but would trigger an intermediate screen, such as an image with instructions on it informing you what to do with the RFID wrist band. Once we had finalised the concept we started looking into the equipment that would enable us to do what we wanted. We looked at a number of options, ultimately what we went for worked very well. The content is displayed on a 24 inch screen, used in portrait orientation. There is an actor speaking to camera, with their head and shoulders in shot, giving the actor lifelike dimensions. We needed something that would play the content and to be able to accept triggers so we looked in to Raspberry Pi. 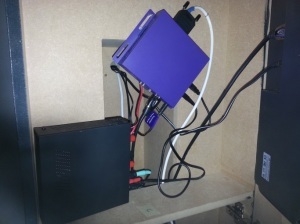 For what we wanted to do there would be a lot of programming and coding, and we were also not sure if the Raspberry Pi would be instant enough on the triggering as we were informed Raspberry Pi could have a slight delay in triggering hd content. We wanted instant triggering and relatively easy setup/programming as we were limited on time, so we went down the route of a media player. 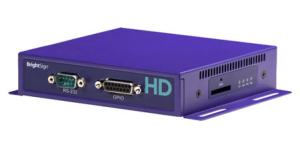 We selected a Brightsign hd1020 media player which has GPIO and allows you to connect buttons to trigger content, and also has USB input so you can connect a keyboard to it. The programming of this media player is relatively easy to do as it has graphical programming software you load on to your pc. These three elements were what we needed to make our concept work. 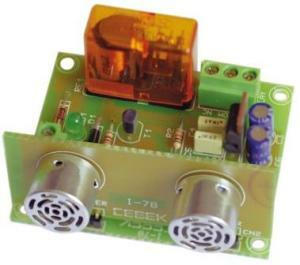 The GPIO is connected to an ultrasonic sensor, which sends out a high pitched audio noise (well above human hearing) and listens for the echo to return. The sensor allows you to increase or decrease the sensitivity, meaning you can set the distance of how far you want it to trigger. It also has a ‘stay open state’ and ‘stay closed state’ feature, so when a person is watching the content the sensor will stay in an open state (as it is still detecting an object in front of it) and once the person steps out of the sensor’s range it will switch to a closed state and the content will finish. This will trigger the content. If visitors read the instructions and decide they don’t want to view the content they can step away and the sensor will detect there is no one in front of it and switch to the attractor image. If a visitor decides to trigger the video content with the RFID wrist band and decides that they’d rather not watch any more, they can step away and the sensor will detect there is no one there, so the video will end and go back to the attractor image. In the exhibition we have six of these RFID interactives; we’ve named them Character Points. We quickly realised that there was an issue with the triggering. We found that the sensors were not staying in the open state; they would go into a closed state and open state repeatedly which meant the content wasn’t staying on the screen for long. To overcome this we bought a timed relay and wired it in to the sensor. The relay activates when the motion detector senses a person and holds the sensor in an open state – we set the time of this to 10 seconds. The relay gets activated even when it’s holding, meaning it will continuously reset the timer to 10 seconds as long as it’s detecting something. Now when a person steps away from the sensor’s range the content will stay on screen for 10 seconds then switch back to the attractor screen. Another issue we had was that some visitors decided to poke their fingers through the holes that the sensor’s microphones stick out of. These need to be visible otherwise the sensor will not work (you can see these microphones in the photo of the sensor above). The sensor would get dislodged and fall inside the character point. We tried using glue and silicone to stick these sensors to the door, but visitors still managed to push the sensor through. We found good old gaffer tape held the sensor in place and can withstand a lot of force if someone tries to push the sensor through. Now that we have the equipment to do this kind of interactivity, we’ll be using it in other interactives. Hopefully in the future we can expand on this to make it in to a long-range RFID system.